You are currently browsing the Meranda Writes weblog archives for March, 2008. I’ve commented before about people leaving the journalism profession for greener pastures. I think I’ve encountered more people who say, “I used to be a journalist,” than I actually know personally as working journalists. I mean they’re in all walks of life, everyone from teachers and house wifes to lawyers and business owners. And that’s not to mention the PR workers who’ve fled this biz. Yet today I was still a bit surprised and saddened when I learned that one of the other young reporters who works with me is “selling out” to go shuffle paper for the federal government — making almost more money in his first year than I’ll likely make after a decade. Really, I shouldn’t be surprised. I like the kid — a kid, I guess, just like me; in fact, he started here part-time about the time I did and just graduated last May — and he did the job well. But the thing was, it was just a job. He showed up, got his assignments, did them without complaining (my editor loved this) and went home. So, when I asked him today why he decided to take the other job (aside from the obvious pay increase and daytime hours, lack of weekends, lack of people yelling at you or returning your calls, shorter commute, etc. ), he was pretty blunt. Basically, he said, “If I’m going to hate my job, I might as well be well compensated.” Not that his job was terrible or that he didn’t like it, but he said he could only cover so many CAFO meetings where no one would talk to him. Plus, he said he’s resigned himself to the fact that he won’t like any job. But he figures, it’s only eight hours a day. I guessed two posts. But he corrected me, three. He had read them all, apparently. He’s a bigger fan of angryjournalist. But that’s another point entirely. The differences between this reporter and myself span much more than the month and a half age difference, the colleges where we earned our degrees or the states we claim as our homes. There is something fundamental that many working journalists don’t get: You can’t just “do” journalism. You have to want to effect change — however small and however many unreturned phone calls or boring meetings it takes. You have to care about the community you cover, whether it’s a topic or a geographic region or both. You need to have a purpose. You have to believe in it. As for me, I think he was right. I care too much, almost to a fault. But I don’t think that’s a bad thing. Journalism could use more people who care. It’s the people who believe in it who will make sure it outlasts whatever technological shift the world endures, and who will figure out a way to see the work we do persists, stays relevant, and, hopefully, thrives. If you know Indiana, you know we’re usually fly-over territory for presidential candidates. I was in college in Ohio during the last election. So I have seen several presidential hopefuls in person. But tonight was the first time I’ve been in the same room as anyone who ever commanded this country. Let me say this, the experience was intense. But not because of what he said or the 3,000+ crowd in the gym, another gym and the school auditorium. It was intense because of my assignment. The only story I wrote for tomorrow’s paper was a look at the preparations the high school underwent and the excitement from the students. That makes sense, since I’m the education reporter and all. I headed to the school at lunch and talked to the principal and some students. I came back and wrote an online version of the story to kind of give a feel during the day of the atmosphere. Then, before 3 p.m., I’d filed that story for print and moved on. Today was also a big day on my beat, so I worked a little on another MAJOR story on my beat that will go online early tomorrow morning, followed with a more in-depth story for Wednesday print. The Adequate Yearly Progress results — basically, whether a school is failing or not under NCLB — were released with a 10 a.m. Tuesday embargo. I was also, throughout the day, talking to the campaign, the schools, etc. checking on information we were hearing and answering questions our readers asked. Lining up logistics with my editor, other reporters and photographers. And then, at 4 p.m., it was time to really tackle my assignment: Updates from the scene throughout the night. That was three hours before doors opened and four hours and 40 minutes before Clinton took the stage. All told, I sent my editor 18 updates from my laptop at the scene. I know because I counted the number of e-mails when all was said and done, and I could finally breathe. I had started them with subjects, “Clinton update #1,” “Clinton update #2,” etc. By number 11, I’d lost track. That was also about the time he actually arrived. My subjects became: Clinton arrives, clinton iraq, clinton economy, clinton education, etc. Some of the updates were detailed narratives, describing the crowd, the atmosphere and talking to people lined up. Some were just a short synopsis of where it stood: Police chief says Clinton left previous stop, expected by 8:30. I adapted my method in the middle. 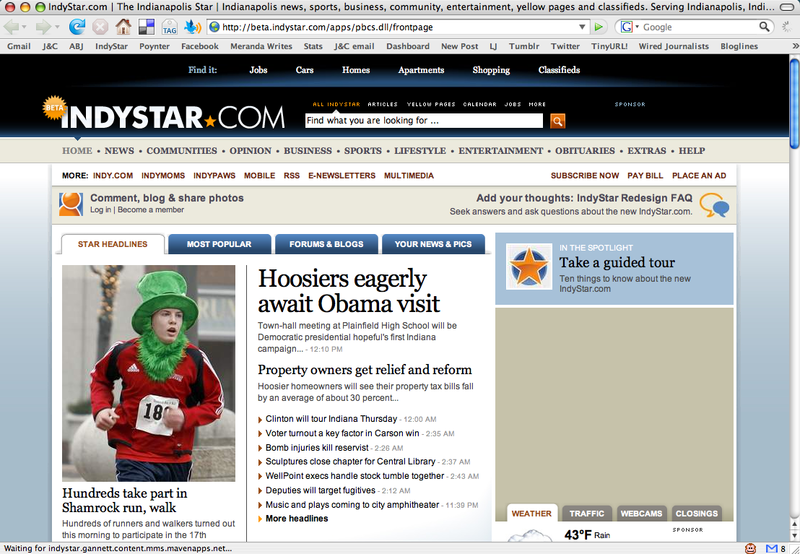 I wasn’t looking at jconline throughout the event, so I didn’t really know how my editor was playing what I submitted. I was trying to get my next update reported and keep the information fresh. There were a few other reporters in the crowd as the event start approached, and they were also there helping catch some color from the lines and feeding it to me to send in with my updates. By about 7:30, I just started typing them with time stamps and then jumping in with what I was hearing and what was occurring. This, as it turns out, was a pretty efficient way of writing the event backwards, much like a twitter stream. Actually, at the same time I was writing for and filing updates to jconline, I was also trying to post updates on Twitter. Though, obviously, my priority was on the J&C, which reaches far more people than my Twitter account. Though it was cool, and you kind of see it in my updates, I was even interacting with other people back at the J&C and also across the room from me. You can look at jconline and see, my updates were fairly regular. As Clinton began to speak — an hour and forty minutes after doors opened and the crowd started streaming in — I started to chunk the topics into five or six graph break downs. I tried to mirror that while the e-mails sent with my snappy posts on twitter. What Clinton said, a little context and any crowd reaction. It was difficult, as you’ll see I noted in one of the twitter updates, to both be there and not be there. I was present, but I spent a lot of time basically taking diction and then trying to make it digestible, readable updates. While stream of consciousness might work for twitter, it wouldn’t cut it for the J&C. So I was using a skill I’m not sure I’ve ever had a chance to practice: I was both listening to what he was saying in the present and writing a story live about what he had just said while monitoring the discussion for what would come next. I’m sure my writing wasn’t my best work — for one thing I used the word crowd entirely too often, and most of the speech updates start “Bill Clinton discussed.” But I wrote fast, and I wrote a lot. And give me some slack, I’ve never — in fact I don’t think my news organization has ever — done anything like this. Twitter aside, my work for J&C was half live blogging and half writing for the newspaper audience online. All my work was funneled through my editor to be posted. So there was about a five-minute delay. But considering how furiously I was filing, I am glad he was there to read over my shoulder and relay any questions or fix obvious mistakes. So there was a lot of figuring it out on the fly. And you know what, like I said, it was intense. But it was awesome! It was even quite a bit of fun. I don’t know if every event deserves such rapid-fire updates, but this was something that was changing by the minute early on, and which had a great deal of interest in our community. It’s not every day a president drops by small-town Indiana. I’m not sure how many page views we generated today or if that even matters. I’m not sure what part my updates played in any of that, but I hope our readers who were planning to attend, did attend or couldn’t attend benefited from the pretty comprehensive look at the day the former president visited our community. With that said, it’s now approaching midnight. I worked from 10 a.m. to 10:30 p.m. today coming off a 2 to 10 p.m. shift Sunday. I need to get in around 8 a.m. tomorrow to finish the AYP story for online. In short, though I’m pumped with all that journalism-is-alive adrenaline from my day, I’m also exhausted. I think it’s time to put the computer away and wind down from probably the most exciting day of journalism career to date. In case you haven’t been paying attention, or in case you don’t look at Gannett newspaper Web sites… They’re all going to the GO4 design. There will be a definite Gannett feel from Palm Springs, Calif., to White Plains, N.Y.
My paper‘s redesign is supposed to go live on March 31. I’ve been told it will most closely resemble the Asbury Park Press in color scheme and design. But I haven’t actually seen it yet to compare. 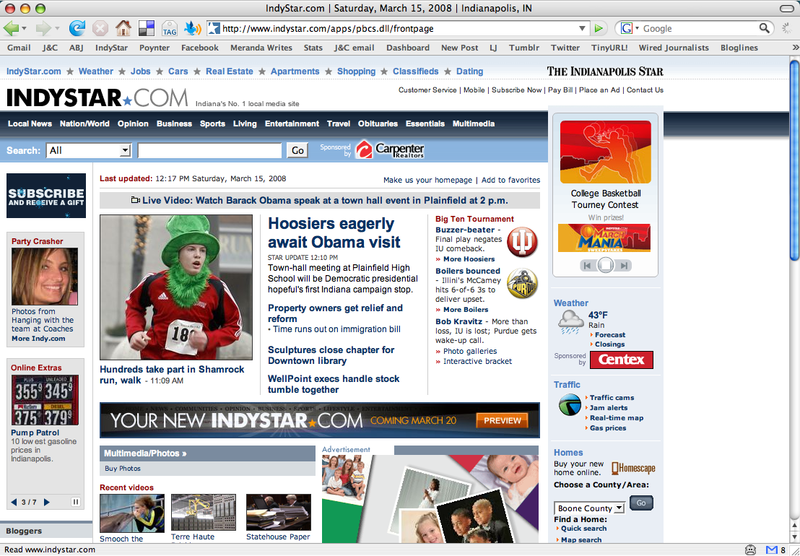 The Indy Star, my paper’s big sister in Indiana, has posted a link to view its beta version of the redesign. You can view that here. They have a FAQ about the design here. Note: That big beige blob is a blocked ad, not a design flaw. 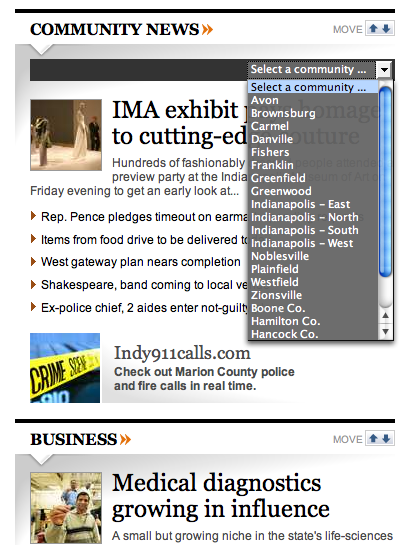 I trolled through most of the Gannett newspaper Web sites this afternoon to see how Indy compared to others. I’d seen several on the new design before. But Indy is the first I’ve noticed that took the concept and really made it its own thing, not its own version of the template. If that makes sense. Even the Detroit Free Press, which appears to have gone with the same basic color scheme and fonts as Indy, just looks like a version of the template. Whereas, Indy really owns its design. You can move and reorder the content boxes on the home page. This feature is far and away my favorite take on the boxes. It puts me in control of what news appears at the top of the page. For instance, I can move sports to the bottom. I can move entertainment to the top. Or I can leave Community News but I can pick only news relevant to my community (if I were in the Indy Star area that is). Note the blue arrows in the corner of the Community and Biz sections in this image. Sure it’s simple. But this item at the very top of every page is sleek. The images are inviting and show me what I’m clicking on. It’s a nice touch. This site index appears at the end of every page. 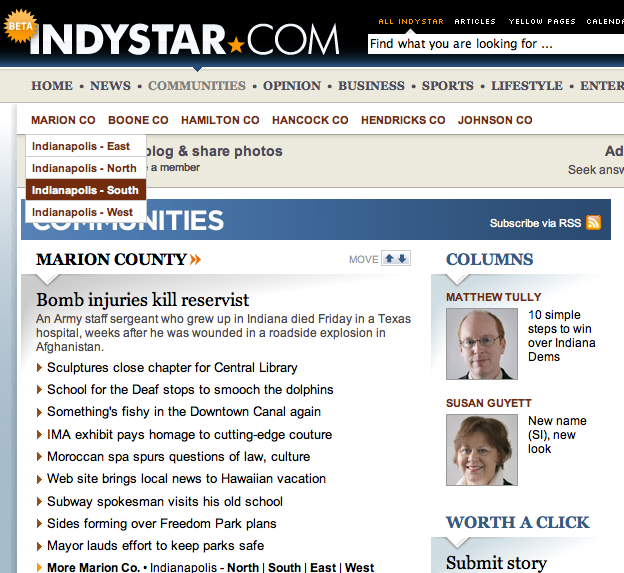 I like it because it gives me a comprehensive guide to what all is available at IndyStar.com. Also handy if I’m looking for something specific, like education or crime stories. There are similar drop downs on the other communities and sections on that top menu. In News, for example, you can break down by the type of coverage. So if you’re into politics, you can click that or go even more specific with legislature. •Video on the story page?! According to Numero 3 in their top 10 things to know package at least. I couldn’t find it in my searches. I have to say this is my biggest pet peeve after annoying drop-down advertisements about the Star and any newspaper Web site that sends me to another page to view video. I hate, hate, hate, hate, hate — I’m not sure hate is even a strong enough word for my animosity — the way the videos are currently handled at the Star and most Gannett sites (my own paper’s included). Where they throw up the videos all on one page with a one paragraph note (sometimes) and a byline and it just plays. Sure, there’s a place for that type of depository for videos. It’s not what I want when I’m specifically interested in one specific video related to one specific story. I’m kind of curious if one of the Indy reporters wasn’t the one who wrote into Ask The Recruiter last month with a concern about reporters pictures. Even if it was, it was an interesting conundrum then as it is now. But that’s the topic of another, and I’ll even go ahead and say forthcoming, post. Suffice to say me personally, I wouldn’t mind. But I don’t cover high profile murder or gang cases either. Yes it can be annoying to be stopped by wackos who recognize I work for the newspaper, but it can also be a great source of story ideas when parents randomly recognize me in the hallways. I’m not sure that was the reasoning behind the Star’s move. I’m guessing it had more to do with creating that social-networking feel of everybody being everybody’s friend and neighbor. Or something like that. I haven’t really dug into many of the other GO4 designs to see if this is standard practice or a unique Indy element. OK, OK. Enough. That’s just a quick summary of some of the things I liked. There are bound to be plenty of other cool things below the surface once I start to interact with the site more. For now, that’s a general overview of things that are different from before. It could be worse. It could be the old Knight-Ridder template that was never innovative and really served no purpose except to throw up as many links on the front page as possible. It could be as ugly as the old Gannett template many papers still have as their backbone. It’s really not. In many ways I really like the design. It will take some getting used to, but it’s aesthetically pleasing. The color choices I’ve seen seem to work well together. There’s a lot of information, but it’s not link-happy. It’s both more and less restrictive than many papers’ current designs. It’s more engaging and interactive for the readers as well. It will also feature social networking platform(?) Pluck, a la USA Today, instead of the myriad methods patched together based on forums, topix, Get Published, etc. My only hold-back is I still don’t know how much I like taking the power to determine the best design for the local readers out of the local hands. For many papers, especially smaller papers, this will be a God-send and get them out of the 1990s design-wise. For others, like the IndyStar, this has meant really working hard to work within the system without being a slave to it. I hope we see more papers going the Indy way. (* The Freep has the design live, but its header image says beta still. I’m sure that’s not a complete list. But it’s good enough to show a range of the color schemes and how similar they all look.